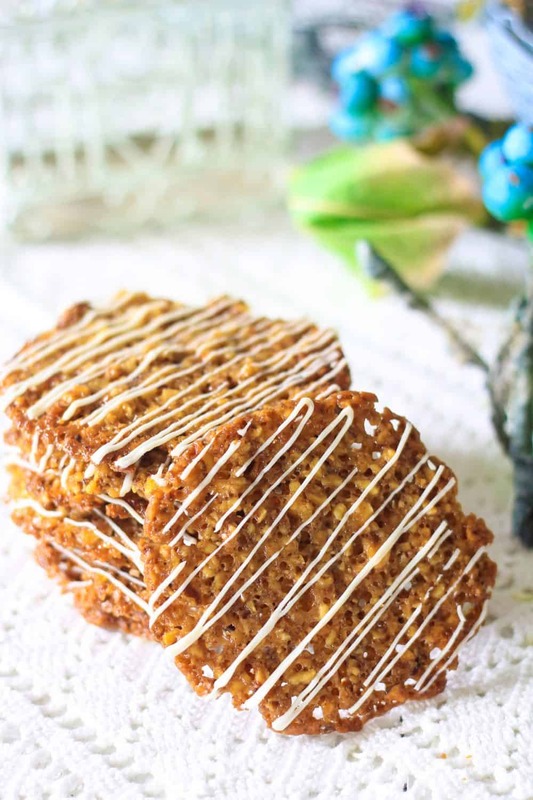 Florentine Cookies are the perfect delicate balance of crunchy sweetness that melts in your mouth. This simple recipe will become a favorite in your cookie tin. Alongside these delicious cookies, you may want to add some of our simple Linzer cookies or even Amaretti cookies for more delightful flavors that are easy to make but still delicate and beautiful. 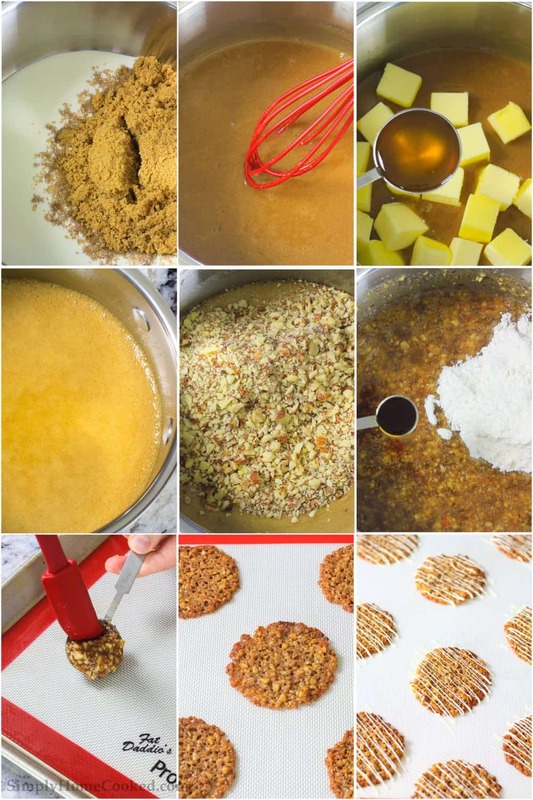 This recipe was originally posted November 13, 2015, we’ve tweaked it a bit since then. This post may contain affiliate links. Read my disclosure policy here. 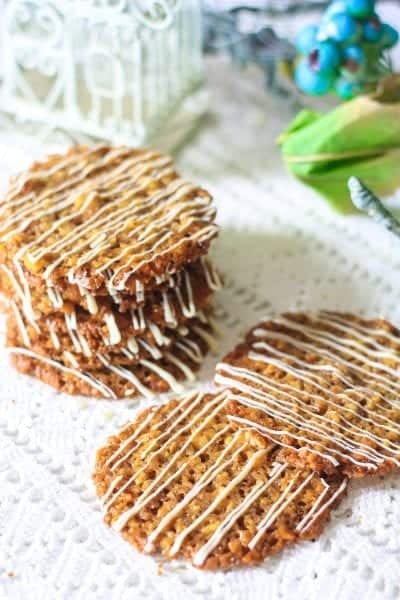 These white chocolate almond florentine cookies make a perfect holiday gift. Most of the ingredients in this cookie are probably sitting in your pantry or fridge right now. They’re very simple to make, but look so pretty! They can even be served at a tea party as well. But you might not want to put all of them out, they will disappear faster than you think. I’ve seen some people sandwich this cookie between a layer of chocolate, but I prefer less chocolate on them since I love the taste of the caramelized almonds so much. But if you like chocolate, go ahead and sandwich them in between chocolate. 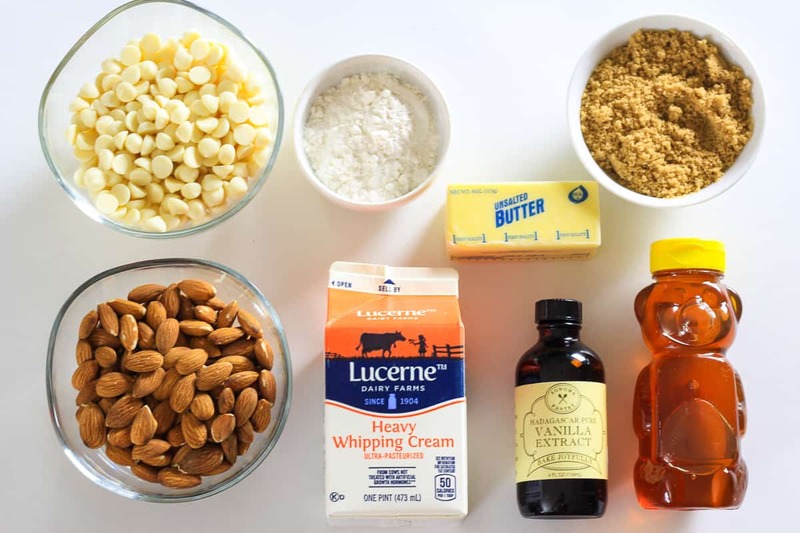 Following the printable recipe below, prepare the almonds by pulsing in a food processor until fine. Once they are ready, you will combine other ingredients in a saucepan over medium heat and follow directions for bringing to a boil before adding in the almonds to form the cookie batter. Use a small cookie or ice cream scoop to scoop the batter onto your prepared baking sheet. Bake as directed and allow to cool before topping with a drizzle of white chocolate. Tip: You can pour cooled melted white chocolate into a plastic sandwich bag and snip off one corner to create a simple piping bag for doing the white chocolate drizzle. Finely chop the almonds, or pulse them in a food processor. In a saucepan, combine the heavy cream and brown sugar over medium high heat. Add the butter and honey into the saucepan and let it come to a rolling boil for about 3-4 minutes. Add the chopped almonds and let it come to a boil once more for 3-4 minutes. Keep the batter over medium heat until it thickens. Remove the saucepan from heat and add the flour and vanilla extract. 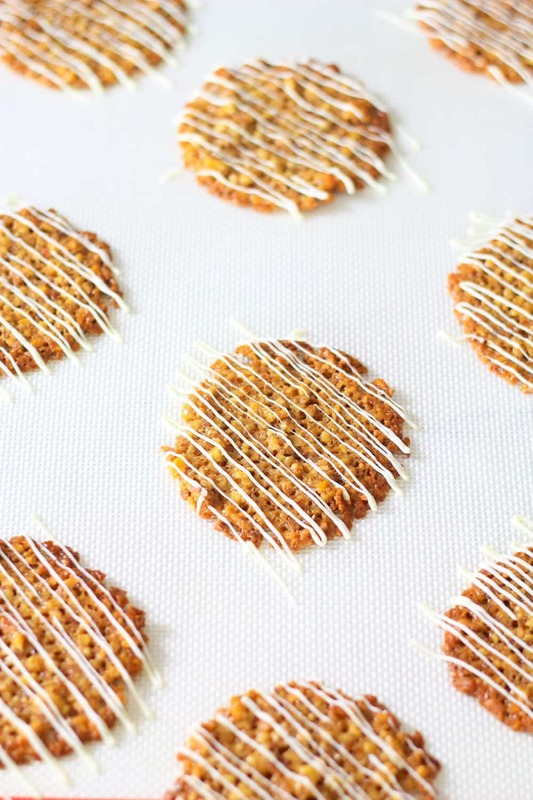 Scoop out 1 tablespoon sized mounds of the batter onto a silicone mat or parchment paper. Using your hand, slightly flatten out a each mound. I do this to ensure a thin even layered cookie. Bake at 325 degrees Fahrenheit for 7-8 minutes or until the edges of the cookies become slightly brown. If you want a more crisp cookie, bake for 1-2 minutes more. Once the cookies have cooled, melt the white chocolate and drizzle a desired amount over each cookie. Oh. My. Goodness. !!!!! So so so so good!!! These cookies were SO bomb!! Didn’t think they’d be as good as they were/turned out!! Hubby was a huge fan also!! These are so yummy and ‘fancy’!! Will definitely be making again and again. And again. ???????? Thank you Dina!! -didn’t change a thing when making these cookies ??????? ?